In the era of Digital Transformation, the customer journey has become truly omni-channel. Regardless of what channels users take, they need to be offered a seamless customer experience: one that is consistent, smooth and quick. Testing is essential to ensure clients enjoy a high-quality experience that leads to good performance and builds loyalty. Open has been helping companies and organisations to achieve this for many years. Its expertise makes it possible to add value to the new uses offered by digital transformation and to turn the customer’s omni-channel journey into a key link in a company's value chain. OpenTesting’s complete coverage is what makes it a consulting and service solution that can guarantee the quality of your applications and an ideal user experience. 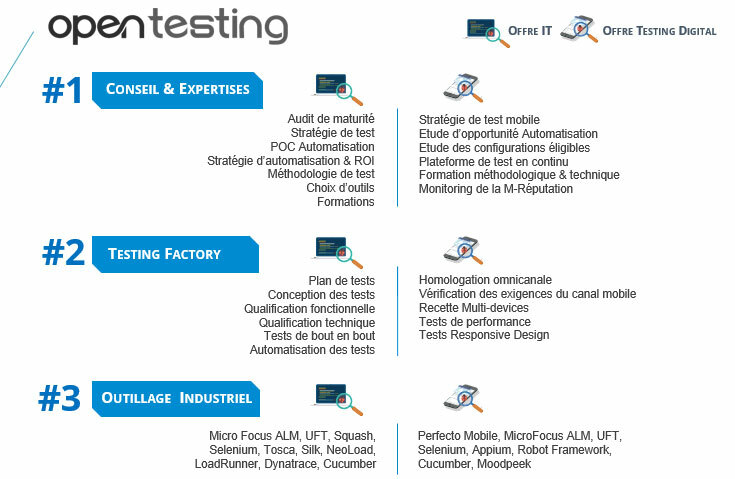 LABTesting byOpen: Incubate your Tests/QA projects! Drawing on over 10 years of Testing expertise, Open is proposing a new innovation-packed programme dedicated to tests, in a single location.